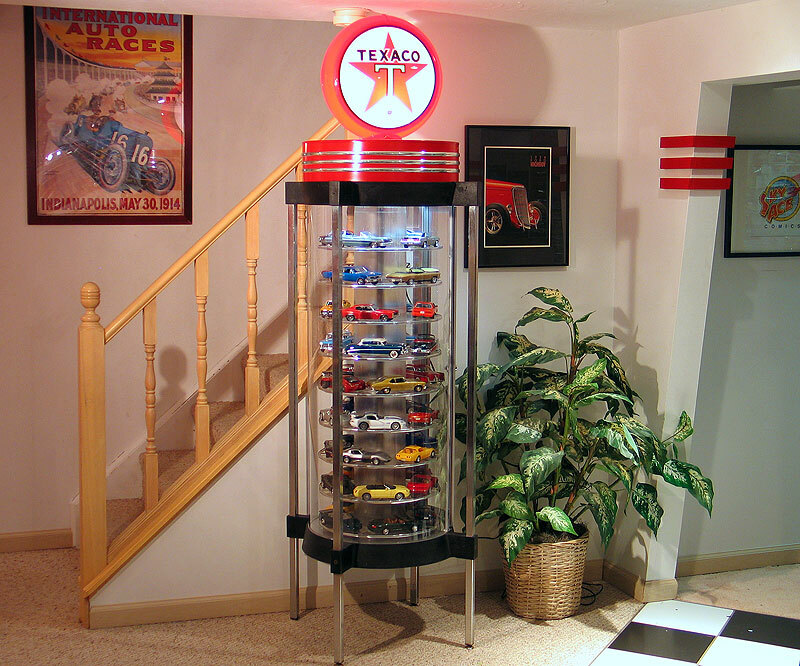 I built this custom Texaco Oil themed model car display case by re-purposing an old Timex Watch display that I found on Craigslist. 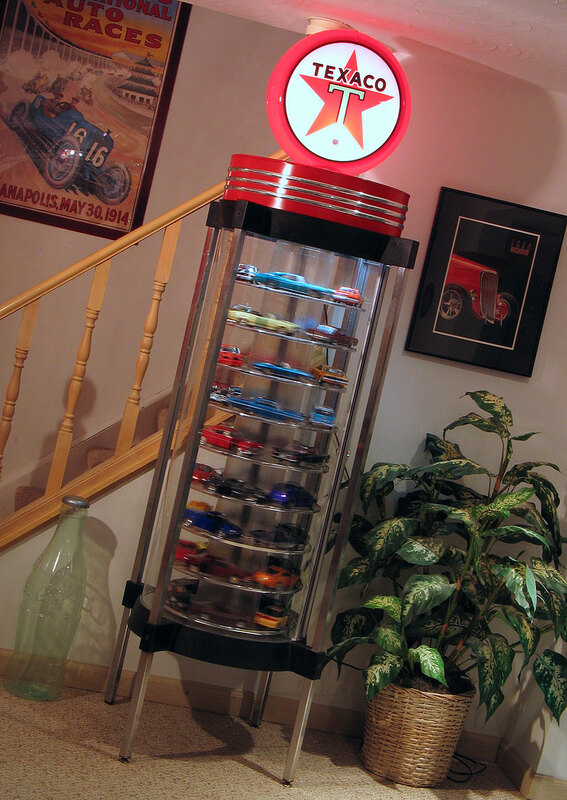 I have several other wall mounted display cases in my man cave but I was wanting a freestanding unit. I was looking for something unusual that could be a centerpiece in my room. I searched our local Craigslist ads hoping to find something different than the standard glass counter displays that most people use. 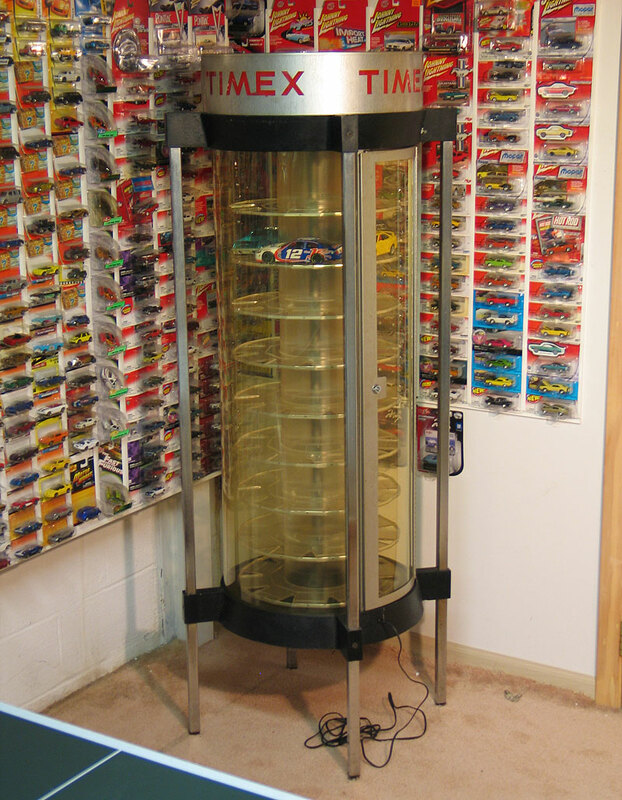 Finally, after several months, this old cylindrical Timex Watch display popped up for $50. Luckily, the address for the listing was only 4 miles from my house. So, I hopped right over and bought it. Timex made these displays in various styles from the '50's through to the '80's to display wrist watches. I believe mine dates back to the '70's but I'm not really sure as there were not dates to be found anywhere on the display. A really neat feature of these displays were the fluorescent lighting mounted up inside the topper and the rotating shelves that were driven by an electric motor. Thankfully, both of these still worked in my display. While the display was in generally good condition it did have a few issues. First, the Plexiglas outer tube was scratched and had yellowed from sunlight. Also the silver edge molding on the shelves was falling off and the metal legs had some surface rust on them. After carefully disassembling the display I replaced the Plexiglas with an all new clear piece. The shelves and legs were carefully cleaned up and repaired. While I was at it I also repainted the metal access door. 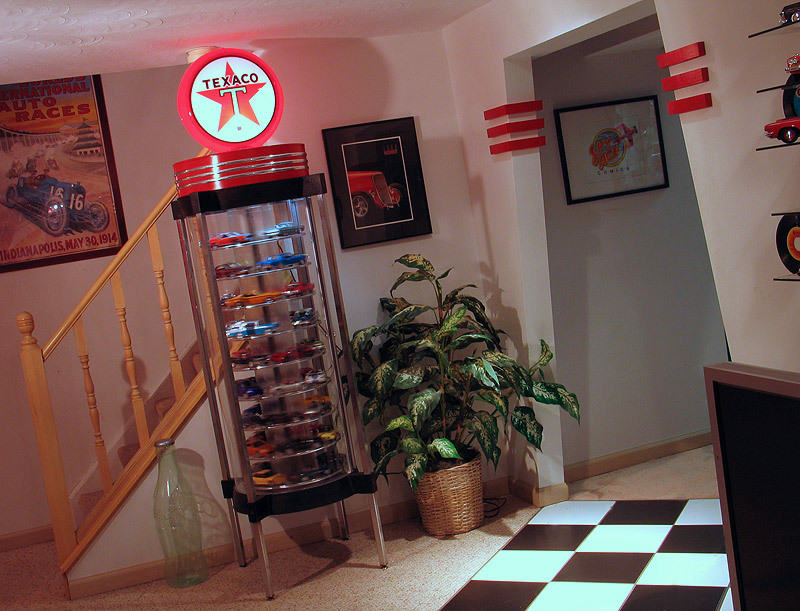 Since I wanted to use my display for model cars and not watches I decided to modify the topper so it would blend in with the other '50's automotive station gas design theme in to my basement. I bought a reproduction Texaco gas pump globe and made a light for it from some parts I got at Home Depot. I repainted the Timex top in red to match the Texaco globe and then mounted the globe on top. My basement has a 3 stripe motif running through the room, so I bought self adhesive 3M chrome 1/2" edge trim (found at the local auto parts store) and used it to add the three chrome stripes under the globe. I also replaced all the shelf edge molding using smaller 3M 1/4" chrome edge trim. This stuff is normally used to dress up door edges on cars and the chrome really added a lot of visual pop to my display. I also painted the bottom silver in silver to better reflect light from the bottom. I was really happy with how this display turned out and it stores about 45 1/25th scale cars. The picture below shows what the former Timex display looked like before I rebuilt it.